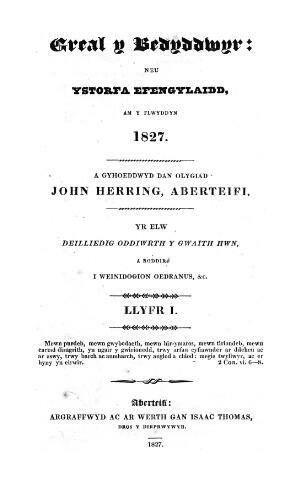 A monthly Welsh language religious periodical mainly serving the Baptists of south Wales. The periodical's main contents were articles on religion, missionary news, domestic and foreign news and poetry. The periodical was edited by John Herring (1789-1832) until December 1827, by John Herring and Joshua Morgan Thomas (d. 1853) until December 1829, by Joshua Morgan Thomas until January 1833, by John Jenkins (1779-1853) and Llewelyn Jenkins (1810-1878) until September 1834, and subsequently by Llewelyn Jenkins.